Kyiv, 20 May, 2014—A new phase of the Community-based Approach to Local Development (CBA) project launched today will engage with local authorities, community organizations and private sector across Ukraine to develop and carry out initiatives aimed at improving people’s living conditions. In its third phase, CBA project will support the Government of Ukraine in carrying out the decentralization reform which aims among others at improving services to people as well as strengthening capacities of regional and local authorities across Ukraine. The project will rehabilitate basic social and communal infrastructure in the area of health, environment and water management while small farm and non-farm activities will be developed in rural areas. With most activities innovative practices and technologies will be applied and energy efficiency measures will be taken into account. 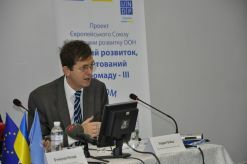 "Since 2007, the CBA Programmes have been one of the most far reaching EU funded programs in Ukraine. These have been not only an important tool for financing social infrastructure micro-projects but also stimulating a change for better in the local governance and among its people." 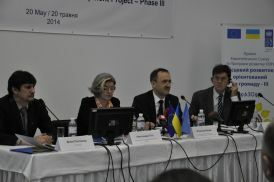 –Andrew Rasbash, Head of Cooperation, Delegation of European Union to Ukraine noted – "The new CBA III, with its 24 million Euro budget, will continue promoting community-based approach to local governance and small economic initiatives in rural communities". Same as in previous years, the new phase will offer opportunities for municipalities to implement energy efficiency measures in multi-apartment buildings. Resource centres in 200 rayons and 15 municipalities will be strengthened in community-based development and twenty regional universities will integrate community-based development principles and methodology into their curriculum. “Local development is key to achieving the future Ukraine wants”, - said Alessandra Tisot, UN Resident Coordinator and UNDP Resident Representative in Ukraine, during the launch event. - “People are at the heart of our work and by engaging them in the development of their own communities we are fulfilling their aspirations for more prosperity and opportunity for all”. Over the past 7 years, the EU-UNDP funded CBA project supported more than 2000 local development initiatives with 2.5 million people in Ukraine benefitting from improved living conditions in their communities - from health care, water supply, energy-saving street illumination to renovated schools and kindergartens. Over 20,000 community members and 5,816 local and regional officials were trained in institutional development, financial and community project management, participatory planning and assessment. A knowledge management hub helps collect and share knowledge and best practices on community mobilization and participatory governance. The CBA project is funded by the European Union (EU), and co-funded and implemented by the United Nations Development Programme (UNDP). It promotes sustainable socio-economic development at local level by strengthening participatory governance and fostering community-based initiatives throughout Ukraine. Third phase of the Community-based Approach to Local Development will be implemented during 2014-2017 with a total budget of 23.8 million Euro, provided by the European Union (23 million Euro) and UNDP (800,000 Euro).